Q: Why are tangles a problem? A: Tangles turn into mats. While tangles are generally straight-forward to brush and comb out, matting is a tangle of tangles. A mat or two can be removed with advanced grooming techniques on a patient pet. Large mats or large numbers of smaller mats are best removed by clipping them out. At best, mats are uncomfortable for your pet to live with. At worst, mats can create serious hazards to your pet’s health and well-being. The top layer of this ear is a solid mat. Note the bruising in the skin below it. As mats tighten, they pull on the hair, which pulls on the skin. This causes pain and, when the mats are tight enough to pull the hair out, bald patches. Mats cause localized loss of circulation in the skin, which interferes with the body’s ability to heal itself. In extreme cases, poor circulation can cause tissue death and even loss of limbs. When severe matting is finally released, blood rushing back to the surface can cause bruising and, in delicate places like the ears, can rush back so quickly it ruptures the skin. Mats collect moisture and dry slowly, which can lead to irritation and infection. Mats interfere with the coat’s ability to help an animal regulate its temperature, leaving it less protected from both heat and cold. Mats collect dirt, debris, and make a perfect place for parasitic insects to hide. A: A pelt is a network of mats that have interwoven with each other and cover a large portion of an animal’s body. A pelt must be removed by shaving underneath it and frequently comes off in one piece. Q: Why is dematting a problem? A: There are lots of tools and tricks available to make dematting as comfortable as possible for animals. But that doesn’t make it fun. It takes time. Most pets prefer grooming sessions to be short and straight-forward. Dematting requires pets to stand still for longer periods of time, sometimes in awkward positions. It perpetuates the cycle of matting. Dematting damages and breaks hair, which makes it mat more quickly and more tightly in the future. Continually dematting too much hair on a too infrequent schedule means that each subsequent grooming session is more unpleasant than that last. It’s uncomfortable. Even gentle dematting requires a bit of tugging. And even good slicker brushes have scratchy pins. 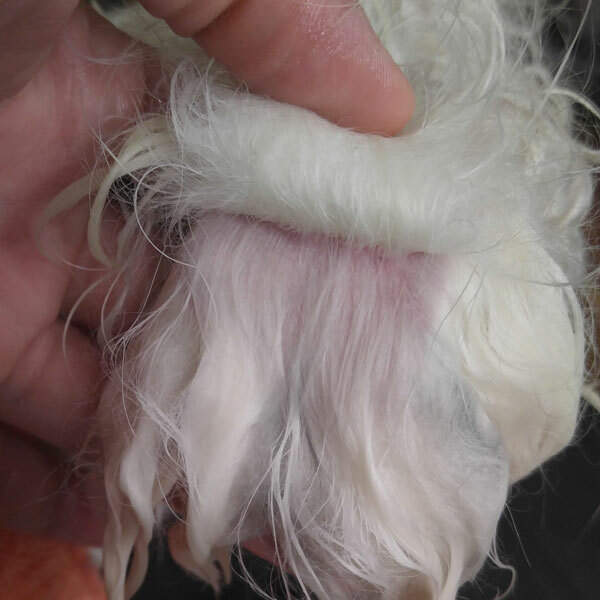 While an experienced groomer will always try to minimize pulling and the pins’ contact with skin, the worse the matting is, the more likely the skin is to get irritated. It’s unnecessary. Mats are completely preventable with some know-how and commitment to maintenance at home, a reasonable length and grooming schedule, or periodic short haircuts. Most of the time, the decision to demat is made for aesthetic reasons rather than for the good of the pet. The fact that something can be done does not necessarily mean it should be done. Any ethical groomer will refuse service to a pet owner who requests unreasonable dematting for a pet whose condition or behavior necessitates a shave. Q: When is it appropriate to demat vs. shaving? A: Any pet in coat can have problems with tangles once in awhile. Five to ten minutes isn’t an excessive amount of time to spend gently unraveling a problem area or two. A good groomer will let you know of any problem areas and suggest ways to alleviate them for the future. For pets who are generally anxious or unfamiliar with the grooming process, asking them to stand for prolonged detangling is unfair and can be dangerous for both pet and groomer. Very young and very old pets should never be expected to put up with excessive dematting or even light detangling beyond what they can easily tolerate. Puppies should have good experiences to build a positive grooming future on. Seniors deserve less fuss and more comfort as they age. No pet should be asked to put up with excessive dematting on a regular basis. No pet should ever be subjected to severe dematting over large portions of its body. No pet should have to bear the discomfort of a matted coat for extended periods of time. A responsible grooming plan not only removes tangles, it’s designed to prevent future tangles, too. A matted coat does not keep a pet warm in the winter, but sweaters do. Not liking the way your pet looks shaved is not a reason to avoid grooming. It’s a reason to have your pet groomed more often! Dematting should be a rare necessity, not a way of life. If your pet’s coat is tangling up regularly, his hair length and maintenance schedule should be adjusted to prevent that. Q: How do I know if my pet is tangled or matted? A: You can’t always tell by looking or even by running your hand over the coat. Often, the top layer of hair stays in decent shape, while the lower levels mat up. When a coat is tangle-free, you can part it down to the skin, everywhere, in every direction. If you can’t make a part, it’s because adjacent hairs are tied together instead of standing on their own. The simplest way to check for tangles quickly is to run a comb through your pet’s coat. Often the tops of their head and back remains untangled while the legs, belly, beard, ears and tail start to mat up, so check these high-risk areas first. If the comb catches, you’ve snagged on a tangle or mat. Light tangles should easily separate with gentle picking of your comb. Mats involve a lot more hair and can only be unraveled by breaking at least some of the hair holding the clump together. Q: What turns tangles into mats? A: A wig sitting on a shelf will never tangle, but animals are constantly moving and doing things, and so their coat will interact with itself. A tangle is two or more hairs tying themselves together. A mat is a collection of tangles getting together and interweaving into a more solid clump. There are conditions that make tangles form more quickly and tighten into mats more easily. Hair length. The number one risk factor for tangling is the length of the coat. Long coats tangle much faster and mat more tightly than short coats. Hair texture and thickness. In general, thin, wiry hair is less prone to tangling than dense, plush hair. This is a big reason why some animals tangle so much more quickly than others. Friction. Collars can create lines of matting underneath them as they rub against your pet’s neck. If harnesses are left on for long periods of time, they can cause a whole criss-cross of matting. Animals have natural friction points in their armpits, behind their ears where they like to scratch, and any place they tend to lick themselves. This is why some spots on animals are more likely to tangle than others. Moisture. Getting hair wet destroys the electron bonds that maintain its shape, which allow it to wrap around itself in all kinds of counterproductive ways. Water also makes hair more elastic, which means it can tie itself in knots that tighten up as the animal dries. Bathing a dog with tangles, rubbing them with a towel (friction!) and then letting them dry is a sure recipe for creating extra-tight mats very close to the skin. Coat damage. Healthy hair is smooth on its surface and that extra slip helps prevent tangles from forming. Damaged hair is spiky and broken, making it act more like Velcro and forming matting very quickly. Uneven coat. When the coat texture is uniform, a medium-length hair next to a long hair will tangle together much faster than hairs that are the same length. Coat breakage and spot shaving can both create this kind of situation. Lifestyle. For all the reasons stated above, all things being equal, a pet who hikes and swims and rolls in things is more at risk for mats than a pet who spends most of his day napping on a couch. Q: What causes coat damage? A: Many things -- including hair chewing, exposure to the sun, and rolling in the dirt -- but grooming is probably the biggest contributor to broken hairs and frazzled hair cuticles. Damage is inevitable, but when you understand how the various types of grooming tools and products work, you can minimize it. For clients with well-maintained pets who like to bathe them at home between grooming appointments, I usually recommend they comb the coat out before the bath, but only if the animal is not too dirty. Body-based dirt like oil, urine, or dandruff in hair is fine to brush through, but actual dirt from outside is gritty under a microscope and those particles will scratch hair cuticles if you drag them across the hair with a brush or comb. Q: What if my pet doesn’t let me brush him? A: Most pets need some training before they learn to accept grooming calmly. It’s important to show them that 1. Nothing bad is going to happen to them and 2. Standing nicely is the correct way to behave. If your pet is fussy, first be sure you’re not causing them unnecessary discomfort. Always be extra careful using brushes and combs around your pet’s face and sensitive areas like the belly, groin, and ears. Be mindful of tugging and scratching the skin. Many dogs have structural problems their owners aren’t aware of so be careful how you manipulate joints (the knees in particular). Be calm but in charge when you’re working with your pet. You want grooming to be enjoyable, but it’s not a game. Discourage them from bouncing around or playing with grooming tools. Reward them when they’re being calm and still. The more relaxed your pet is for grooming, the safer he’ll be when there are clipper blades and scissors whirring and snipping around him. If you and your pet can’t come to an understanding with at-home maintenance, it’s ok to let the professionals handle it. Many pets behave better at the grooming shop than they do at home. You don’t have to do any bathing, brushing, or combing if you don’t want to as long as you choose to keep your pet in a style that works with a regular maintenance schedule at the grooming shop. It can take time to figure out the right length of coat and length of time between haircuts works best for you and your pet. Your groomer should be happy to make suggestions and help figure out a good balance. Grooming needs often change over time as well, so talk over adjustments with your groomer as needed. Q: How do grooming needs change over time? A: Age, lifestyle, health, and behavior all impact grooming needs. Puppy coat is usually easy to take care of until they reach about 6 months old, when the changes in their hair texture make them mat very quickly. After their adult coat comes in, they’re less work than they are during coat change, but more than when they were puppies. Senior animals often go through major changes as their bodies begin to slow down and often need their style and grooming schedules adjusted for their comfort. Usually this means shorter haircuts at longer intervals, but not always. Vacations can mean more time at the beach, in the water, in the woods… all that fun stuff that contributes to matting. It can also mean less time and attention for brushing. A shorter haircut beforehand can prevent a long demat or shaving session when you return home. Illness can interfere with at-home maintenance at a time when there’s enough stress already without worrying about pets getting tangled up. Many clients choose to have their pets style adjusted based on the seasons. When it’s wet in the spring and snowy in the winter, it’s often helpful to have less hair on the dog. A longer haircut does not necessarily mean they’ll be warmer in winter, particularly if the longer coat is getting matted and trapping moisture. Pet hair insulates their body in much the same way as a double-paned window: by trapping a layer of air between the skin and the outside air. For most coats, it takes at least a ¼ inch of untangled hair to create this insulating layer, which helps shade their skin when it’s hot and holds onto their body heat when it’s cold out. For well-maintained pets who are comfortable with grooming, there are many style options available, with new variations on a theme introduced all the time. Many groomers like to mix things up once in awhile, so if you’re interested in trying something new, speak up! In order to maintain an animal with a constantly-growing coat, there’s a lot you should know and do. It can be overwhelming, but it helps to take it one step at a time. If you find you can’t keep up, remember, it’s hair and it grows back. You can always try again. And you can always decide your pet looks cute in a short haircut after all. Every pet stylists wants their clients to be thrilled with their pets’ look. But please remember the limiting factors. In addition to his age, size, and behavior, there’s his hair type, length, and texture. We have to work with the coat that’s put in front of us, in a way that keeps the animal comfortable. The best way to ensure that your pet will go home looking like the cutest version of himself is to bring him in without any matting and communicate clearly what you’re looking for. Your groomer will do the rest!